Originally published in the Owen Sound Sun Times, April 26, 2005. Some time in the next week, the Clarence (Tubby) Schmalz Cup will be awarded to the Grimsby Peach Kings or the Essex 73’s. 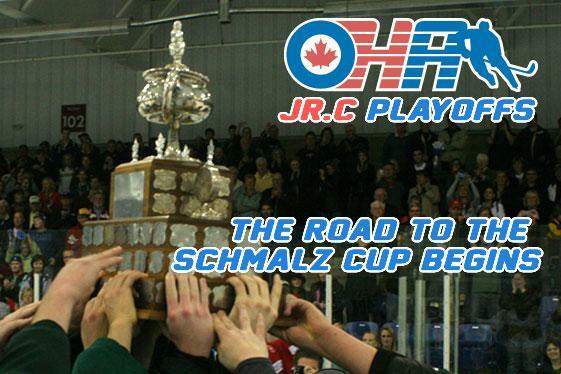 The Clarence (Tubby) Schmalz Cup is the Ontario Hockey Association’s Junior C championship trophy. Grimsby, the Niagara and District league titlist, has won it the past two seasons. Essex, which won the Great Lakes league this year, copped the Cup in 2002. It’s named in honour of the late hockey administrator who was a resident of Walkerton for 42 years until his death in 1981. “We were trying to look at a fitting tribute,” OHA president Brent Ladds said in a recent interview when asked how the trophy got its name. It’s not a surprise, once you consider Schmalz’s record as an administrator, why the OHA felt obliged to pay tribute to him. A native of Breslau, near Kitchener, Schmalz was born in 1915 and moved to Walkerton in 1939. He and his brother Lorne owned and operated the Hartley House, a large hotel on the northwest corner of the main intersection of downtown, Durham and Jackson streets. Schmalz first became involved in the Walkerton hockey scene during the Second World War. By the 1950s, he was running an Intermediate B team called the Capitols. Jim Nixon remembers the fierce rivalry between the Capitols and the team he played for, the Durham Huskies. “When we were on the ice and he was behind the bench, he wanted to win. No doubt about it,” Nixon said. But he also remembers the kindness Schmalz showed toward him and his teammates. “We got storm-stayed over there and he put us up in the hotel, the whole team,” Nixon said. “I got hurt over there and he made all the arrangements for the chiropractor to come to the hotel and look after me. Schmalz became an OHA director in 1956, the start of a 22-year relationship with what was then the province’s main hockey governing body. He served as its president from 1969 to 1972, then took over the association’s major junior program in 1974 and ran it until 1978. Known then as the Ontario Major Junior Hockey League, it eventually split from the OHA and is now called the Ontario Hockey League. Its information guide, to this day, credits Schmalz as the league’s first commissioner. Schmalz received a Gold Stick award from the OHA in 1977 in recognition of his outstanding contribution to the association. A year later it made him a life member. One of Schmalz’s best skills seemed to be his ability to let things roll off his back. “I remember when I was just starting out here,” Ladds said. “We had so many leagues, major junior being one of them, and everybody was so serious about everything. You’d have a board meeting and board members were literally at each other. After leaving the OMJHL, Schmalz moved into the upper ranks of the Canadian Amateur Hockey Association, now known as Hockey Canada. The association presented him with a meritorious service award in 1979, the same year he was elected vice-chairman of its board of directors. Two years later, at the association’s annual meeting in May 1981, he was elected chairman. He remarked at the time that he had attended 26 straight CAHA meetings, unaware that it would be his last. Less than seven months later, on the morning of Dec. 7, 1981, he died suddenly of a heart attack. It was 12 days before his 65th birthday. Tributes poured in immediately from across the country. “Tubby was the most tireless worker I’ve ever seen,” remarked OHA chairman Cliff Phillips. OHA directors formed an honour guard at his funeral two days later at Sacred Heart Church. The association renamed the OHA Junior C Cup in his memory a year or two later, then collaborated with his family in the creation of a commemorative trophy case in the lobby of the Walkerton Community Centre. “We were really pleased, because he did an awful lot for the town,” said Brundritt, who became Schmalz’s stepdaughter while in her teens. He had also been her godfather, but her father died when she was very young, leaving behind three small daughters. Schmalz, who was also survived by a daughter, Marilyn, had other passions besides hockey. A talented chef, he was involved in the provincial hotel association. Through the Hartley Hotel, he and his brother sponsored an intermediate softball team that won four straight Ontario championships in the 1950s. He also served Walkerton and Bruce County as a municipal politician for many years. He was in the middle of his second term as Walkerton’s reeve when he died. “He was well respected by many people here,” said Brundritt, who still lives in Walkerton. “Because he was a big man, you would think maybe that he was gruff, but he wasn’t. He was very kind and very knowledgeable. A big man, his nickname fit him. In this age of political correctness, it’s hard to imagine a large man tolerating a nickname like Tubby, but Schmalz embraced it. Since the OHA Junior C Cup was renamed, only one team from this area has ever won it. Fittingly, Schmalz’s old friend Jim Nixon coached the Hanover Barons to the championship in the spring of 1991. The best honour of all, it seems, is just to have known Clarence (Tubby) Schmalz at all. 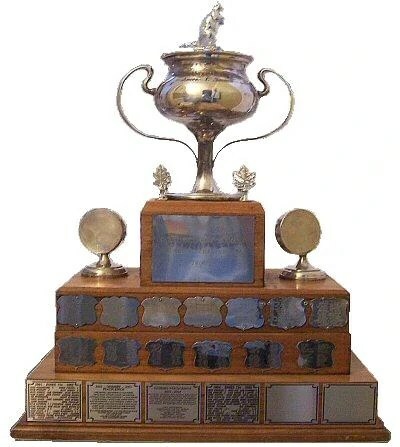 NOTE: Western league teams are still looking for their first Schmalz Cup since 1991. This entry was posted in History, Hockey, Sports and tagged hockey, jonathon jackson, junior c, oha, ontario, schmalz cup, tubby schmalz, walkerton on November 27, 2012 by jonathonjackson.